Young hero Bellamkonda Sai Sreenivas, who was last seen in the fantasy thriller Saakshyam, is now back on screen, this time donning the khaki for the first time in his latest offering, Kavacham, costarring milky babes Kajal Aggarwal and Mehreen Pirzada, which has released today. Here's team AP Herald's exclusive first on net Kavacham review. Bellamkonda Sai Sreenivas plays a young and upright cop, and his life progresses in a smooth way, until the city faces some kidnappings, and Mehreen Pirzada is a testimony to one of those incidents, following which Sai Sreenivas begins to trace the kidnapping anti socials. Meanwhile he's also in love with Kajal Aggarwal, and situations make Sai Sreenivas himself framed in all the crimes in the city. Now he is no more a cop, and he has to prove himself innocent besides also expose the gangs behind anti social activities in the city. Was he able to nab Neil Nithin Mukesh and gang and expose them, and was he able to get back to his cop duty is what Kavacham is all about. 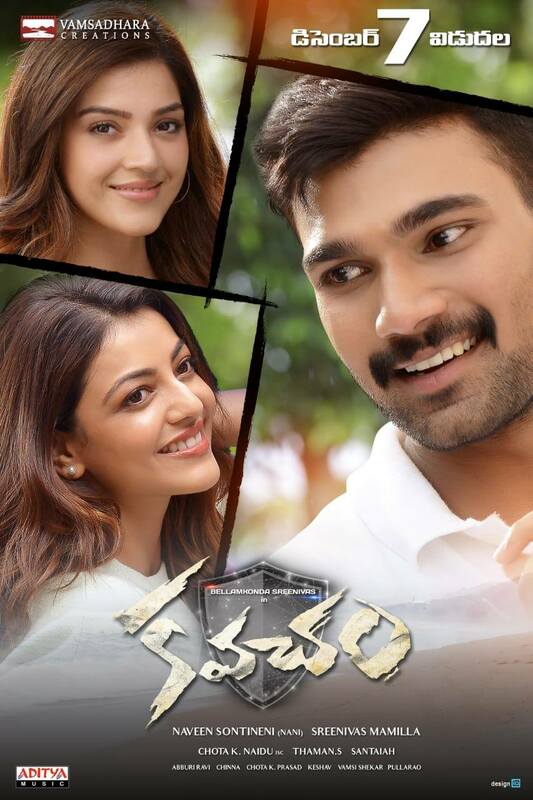 Kavacham (2018) Young hero Bellamkonda Sai Sreenivas, who was last seen in the fantasy thriller Saakshyam, is now back on screen, this time donning the khaki for the first time in his latest offering, Kavacham, costarring milky babes Kajal Aggarwal and Mehreen Pirzada, which has released today. Here's team AP Herald's exclusive first on net Kavacham review. Bellamkonda Sai Sreenivas plays a young and upright cop, and his life progresses in a smooth way, until the city faces some kidnappings, and Mehreen Pirzada is a testimony to one of those incidents, following which Sai Sreenivas begins to trace the kidnapping anti socials. Meanwhile he's also in love with Kajal Aggarwal, and situations make Sai Sreenivas himself framed in all the crimes in the city. Now he is no more a cop, and he has to prove himself innocent besides also expose the gangs behind anti social activities in the city. Was he able to nab Neil Nithin Mukesh and gang and expose them, and was he able to get back to his cop duty is what Kavacham is all about..
KAVACHAM ,director srinivas mamilla written this story and directed ,belamkonda srinivas as acting as cop ,character ,kajal and meheren are join with srinivas in this film,coming to story its cop oriented and action thriller movie ,not a new story to watch some scenes are looking as past movies ,so dissapointed frist half and seocnd half also so bored to watch still climax ,so kajal and meheren characters are help to some whore ,but finally its an average movie . srinivas action back well and how ever he gives his best ,story wise audience not giving postive response ,this time also repeat well ,director also not show a new story level ,glamours of two girls story content was missing to feel ,its a routin cop and some other movies scenes like ,they feel ,i got bore feeling to watch ,still climax i will wait any interesting aspects ,fights and songs nice ,but story wise its dissapointed . KAVACHAM ,as per expectations for auidence are ot satisfied from this story ,srinivas looking good in cop character and kajal and mehren are donr there good work in characters ,but story wise its not a new story ,combination several movies can expirence to audience ,screenplay is week and direction level is good ,music also not so impressed to watch,common audience make feel bored to watch . bellamkonda srinivas ,he was taking a different subjects ,and he creates his own style in movies,now he coming like a cop and power full story and action entertainer KAVACHAM ,director srinivas mamilla was written a power full script and screenplay ,to make audience see with like a new story in cop verison ,and kajal and mehreen two glamour dolls are acting together and both characters are important roles for story ,thaman back gorund beezem other cast and crew are also good ,so all and all power pack story and hero with energytic way ,so watch on big screen this action entertainer and get entertained .,make block buster . All In All, “Kavachaam” Is Another Regular, Commercial Action Film From Hero Bellamkonda Sai Srinivas..
An Old-fashioned Storyline Is Not Saved By A Distinct Template. Lack Of Earnest Narration Robs The Template..
Kavacham Is A Poor Action Drama Which Is Marred By Bland Narration Despite Having A Decent Story With Enough..
Kavacham’ Is Regular Action Drama That Offers Nothing New In Terms Of Story Or Screenplay. Except The..
On The Whole, Kavachm Is A Typical Cop Drama Which Works In Parts. The Interval Twist Is Interesting But The..
A Police Officer Caught In The Web Of An Anonymous Criminal Can Be Made Into An Interesting Thriller. It..
All In All, Kavacham Is A Poorly Made Action Thriller Lacking In Thrill And Mystery. Bellamkonda’s Bettered.. The First Half Is Decent With Some Comedy Scenes And Love Track. The Interval Bang Is Impressive. The Second..